You can exclude an object storage repository from the scale-out backup repository scope, for example, if you no longer want to utilize any cloud-based services to store your data. Consider that when you exclude an object storage repository that is being used and which stores offloaded backup data, then such a repository will be put into maintenance mode automatically. Once in maintenance mode, you will not be able to restore your data from such a repository. To switch back to normal, you will have to add the repository thereof as part of any other capacity tier and synchronize existing backup chains with your extents. After the synchronization is complete, all the existing backups will become available as imported. For more information, see Synchronizing Capacity Tier Data. In the working area, select a scale-out backup repository and click Edit Scale-out Repository on the ribbon or right-click a scale-out backup repository and select Properties. Move to the Capacity tier step of the wizard. 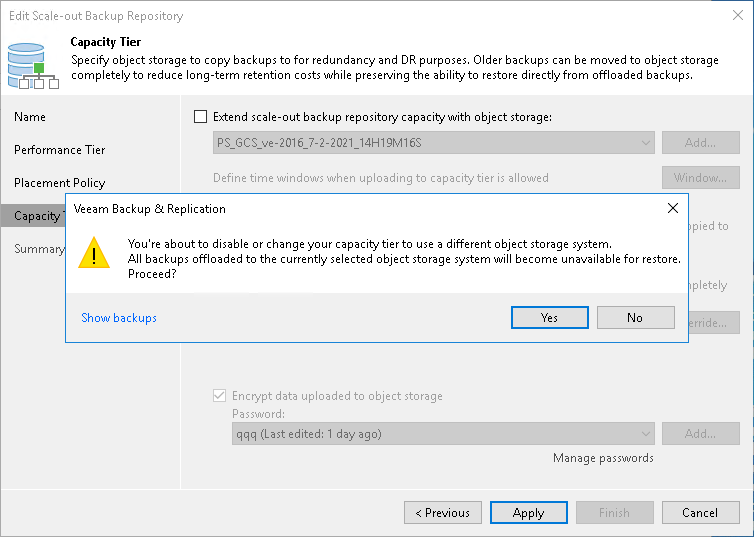 Deselect the Extend scale-out backup repository capacity with object storage checkbox. You will be asked to confirm the action in the dialog shown below, whereupon an object storage repository will be immediately put into maintenance mode.